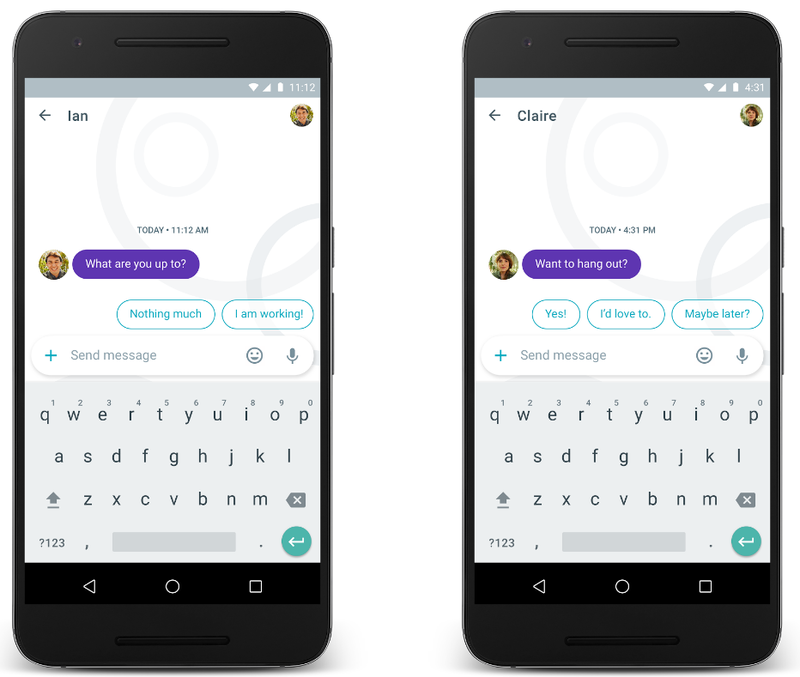 Today, Google announced Allo — our new mobile messaging app. From day one of the Allo development effort, we set out to build a truly special product that is powered by Google’s strengths in machine intelligence to make messaging easier, more efficient, and more expressive. 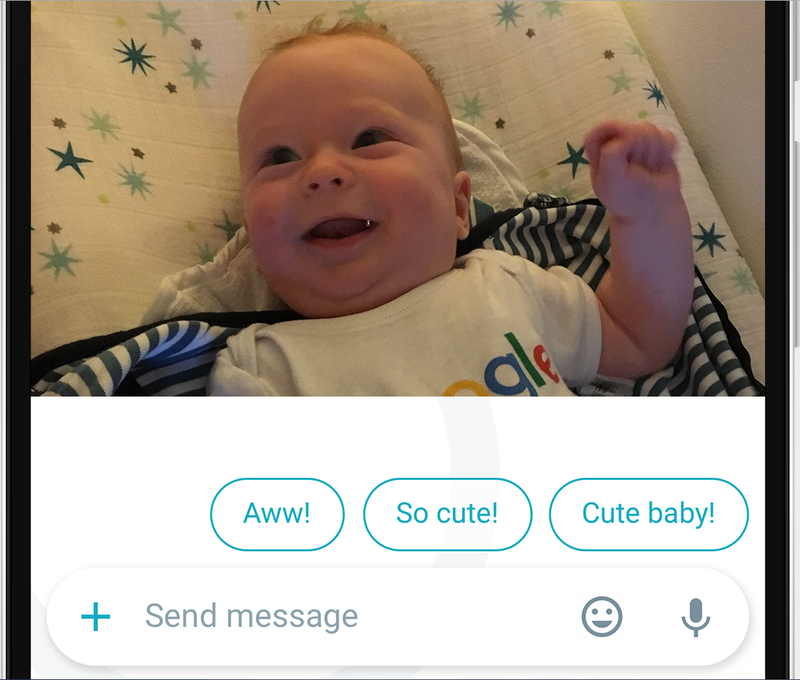 Photo Reply is a unique feature of Allo that just does that! We use machine learning to understand what a shared photo depicts and to suggest rich natural language replies that the user can tap to send. This makes it easier for users to sustain meaningful conversations while using small mobile keyboards. Here is an example of the responses that Allo suggests when a friend shares a photo of his child. During the winter, our product managers, Patrick McGregor and Ryan Cassidy, challenged us to develop new approaches to simplify media sharing in messaging while simultaneously delighting users with Google insights. With my colleagues Vivek Ramavajjala, Sergey Nazarov, and Sujith Ravi, we set out to build Photo Reply. We utilize Google's image recognition technology, developed by our Machine Perception team, to associate images with semantic entities — people, animals, cars, etc. We then apply a machine learned model that maps those recognized entities to actual natural language responses. Our system produces replies for thousands of entity types that are drawn from a taxonomy that is a subset of Google's Knowledge Graph and may be at different granularity levels. For example, when you receive a photo of a dog, the system may detect that the dog is actually a labrador and suggest "Love that lab!". Or given a photo of a pasta dish, it may detect the type of pasta ("Yum linguine!") and even the cuisine ("I love Italian food!"). At runtime, Photo Reply recognizes entities in the shared photo and triggers responses for the entities. 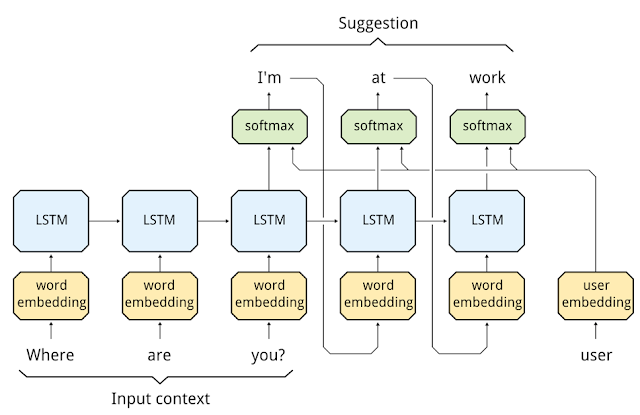 The model that maps entities to natural language responses is learned offline using Expander, which is a large-scale graph-based semi-supervised learning platform at Google. We built a massive a graph where nodes correspond to photos, semantic entities, and textual responses. Edges in the graph indicate when an entity was recognized for a photo, when a specific response was given for a photo, and visual similarities between photos. Some of the nodes are "labeled" and we learn associations for the unlabeled nodes by propagating label information across the graph. To illustrate this, consider the graph below. There are two labels: the red label corresponds to the response "yummy" and the blue label corresponds to "delicious". 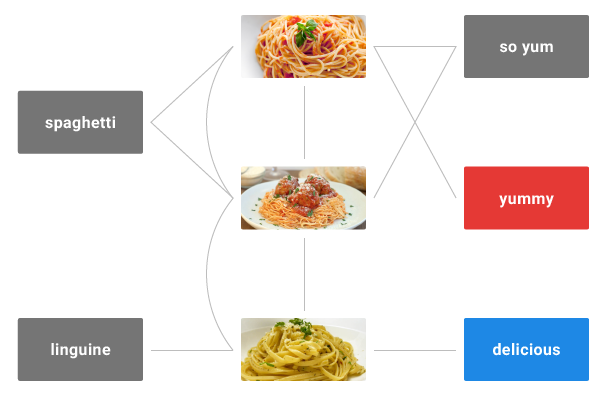 The nodes for "spaghetti" and "linguine" are unlabeled, but from the fact that they are close to the red and blue nodes, the algorithm can learn that they should be associated to the "yummy" and "delicious" responses. Notice that in this way, we are associating the entity "linguine" to the response "yummy" even though none of the linguine photos in the graph are directly connected to this answer. Expander can perform this kind of learning at very large scale, for graphs containing billions of nodes and hundred of billions of edges. Photo Reply is an exciting example of multimodal learning, where computer vision and natural language processing come together in order to create a compelling user experience. Allo will be available on Android and iOS later this summer. Be sure to check out what Allo sees in your beautiful photos! At Google, we are continuously building products powered by Machine Learning to delight our users and simplify their lives. Today, we are excited to talk about the technology behind Allo, a new smart messaging app that uses the power of neural networks and Google Search to make your text conversations easier and more productive. Just like Smart Reply for Inbox, Allo understands the conversation history to generate a set of suggestions that the user will likely want to respond with. In addition to understanding the context of your conversation, Allo learns your individual style, so the responses are personalized for you. About a year ago, we started exploring how we can make communication easier and more fun. The idea of Smart Reply for Allo came up in a brainstorming session with my teammates Sushant Prakash and Ori Gershony who then helped me lead our team to build this technology. We began by experimenting with neural network based model architectures which had proven to be successful for sequence prediction, including the encoder-decoder model used in Smart Reply for Inbox. One challenge we faced was that response generation in online conversations have very strict latency requirements. To address this, Pavel Sountsov and Sushant came up with an innovative two-stage model that works as follows. 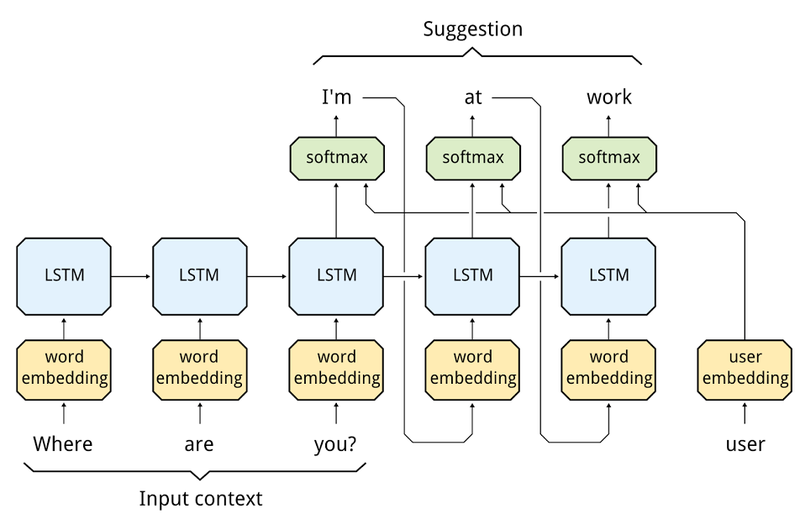 First, a recurrent neural network looks at the conversation context one word at a time and encodes it in the hidden state of a long short term memory (LSTM). Below, we show an example with a context ‘Where are you?’. The context has three tokens, each of which is embedded into a continuous space and input to the LSTM. The LSTM state now encodes the context as a continuous vector. This vector is used to generate the response as a discretized semantic class. Each semantic class is associated with a set of possible messages that belong to it. We use a second recurrent network to generate a specific message from that set. 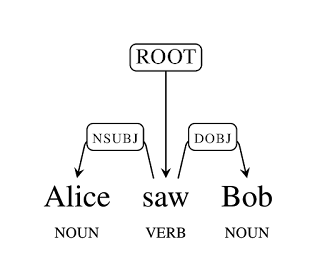 This network also converts the context into a hidden LSTM state but this time the hidden state is used to generate the full message of the reply one token at a time. For example, now the LSTM after seeing the context “Where are you?” generates the tokens in the response: “I’m at work”. 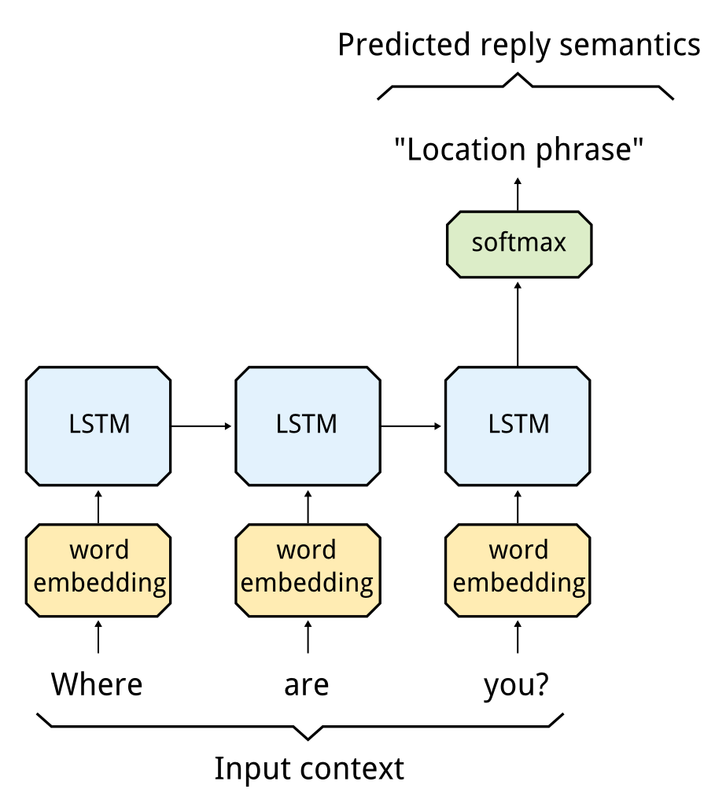 A beam search is used to efficiently select the top-N highest scoring responses from among the very large set of possible messages that a LSTM can generate. 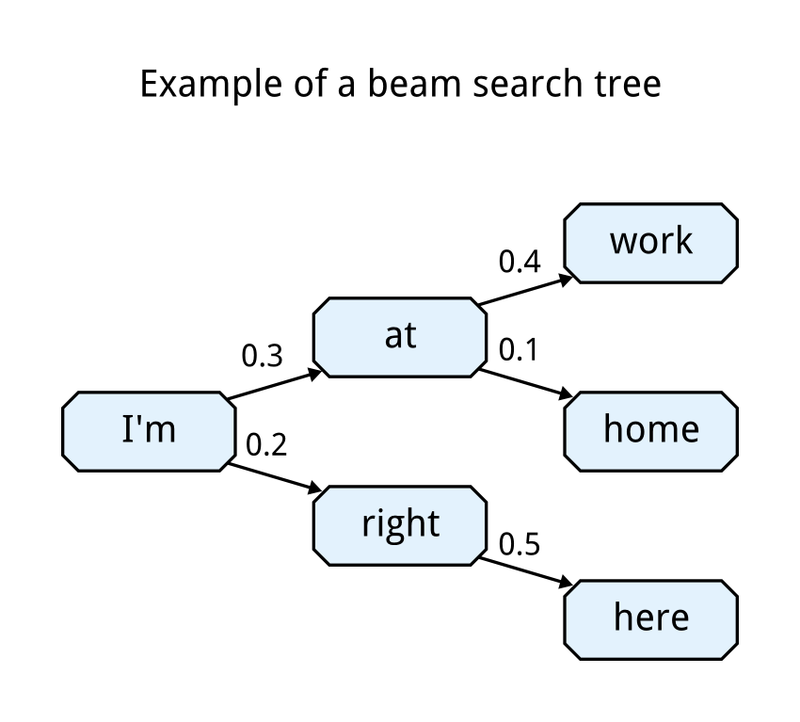 A snippet of the search space explored by such a beam-search technique is shown below. As with any large-scale product, there were several engineering challenges we had to solve in generating a set of high-quality responses efficiently. For example, in spite of the two staged architecture, our first few networks were very slow and required about half a second to generate a response. This was obviously a deal breaker when we are talking about real time communication apps! So we had to evolve our neural network architecture further to reduce the latency to less than 200ms. We moved from using a softmax layer to a hierarchical softmax layer which traverses a tree of words instead of traversing a list of words thus making it more efficient. Another interesting challenge we had to solve when generating predictions is controlling for message length. Sometimes none of the most probable responses are appropriate - if the model predicts too short a message, it might not be useful to the user, and if we predict something too long, it might not fit on the phone screen. We solved this by biasing the beam search to follow paths that lead to higher utility responses instead of favoring just the responses that are most probable. That way, we can efficiently generate appropriate length response predictions that are useful to our users. The best part about these suggestions is that over time they are personalized to you so that your individual style is reflected in your conversations. For example, if you often reply to “How are you?” with “Fine.” instead of “I am good.”, it will learn your preference and your future suggestions will take that into account. This was accomplished by incorporating a user's "style" as one of the features in a Neural Network that is used to predict the next word in a response, resulting in suggestions that are customized for your personality and individual preferences. The user's style is captured in a sequence of numbers that we call the user embedding. These embeddings can be generated as part of the regular model training, but this approach requires waiting for many days for training to be complete and it cannot handle more than a handful of millions of users. To solve this issue, Alon Shafrir implemented a L-BFGS based technique to generate user embeddings quickly and at scale. Now, you'll be able to enjoy personalized suggestions after only a short time of using Allo. The neural network model described above is language agnostic so building separate prediction models for each language works quite well. To make sure that responses for each language benefit from our semantic understanding of other languages, Sujith Ravi came up with a graph-based machine learning technique that can connect possible responses across languages. 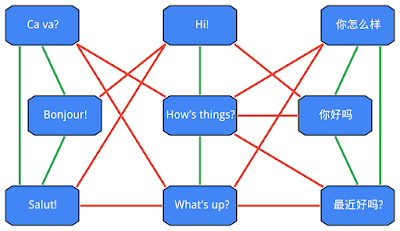 Dana Movshovitz-Attias and Peter Young applied this technique to build a graph that connects responses to incoming messages and to other responses that have similar word embeddings and syntactic relationships. It also connects responses with similar meaning across languages based on the machine translation models developed by our Translate team. With this graph, we use semi-supervised learning, as described in this paper, to learn the semantic meaning of responses and determine which are the most useful clusters of possible responses. As a result, we can allow the LSTM to score many possible variants of each possible response meaning, allowing the personalization routines to select the best response for the user in the context of the conversation. This also helps enforce diversity as we can now pick the final set of responses from different semantic clusters. I am also very excited about the Google assistant in Allo with which you can converse and get information about anything that Google Search knows about. It understands your sentences and helps you accomplish tasks directly from the conversation. For example, the Google assistant can help you discover a restaurant and reserve a table from within the Allo app when chatting with your friends. This has been made possible because of the cutting-edge research in natural language understanding that we have been doing at Google. More details to follow soon! These smart features will be part of the Android and iOS apps for Allo that will be available later this summer. We can’t wait for you to try and enjoy it! At Google, we spend a lot of time thinking about how computer systems can read and understand human language in order to process it in intelligent ways. Today, we are excited to share the fruits of our research with the broader community by releasing SyntaxNet, an open-source neural network framework implemented in TensorFlow that provides a foundation for Natural Language Understanding (NLU) systems. Our release includes all the code needed to train new SyntaxNet models on your own data, as well as Parsey McParseface, an English parser that we have trained for you and that you can use to analyze English text. Parsey McParseface is built on powerful machine learning algorithms that learn to analyze the linguistic structure of language, and that can explain the functional role of each word in a given sentence. Because Parsey McParseface is the most accurate such model in the world, we hope that it will be useful to developers and researchers interested in automatic extraction of information, translation, and other core applications of NLU. This structure again encodes the fact that Alice and Bob are the subject and object respectively of saw, in addition that Alice is modified by a relative clause with the verb reading, that saw is modified by the temporal modifier yesterday, and so on. The grammatical relationships encoded in dependency structures allow us to easily recover the answers to various questions, for example whom did Alice see?, who saw Bob?, what had Alice been reading about? or when did Alice see Bob?. Why is Parsing So Hard For Computers to Get Right? The first corresponds to the (correct) interpretation where Alice is driving in her car; the second corresponds to the (absurd, but possible) interpretation where the street is located in her car. The ambiguity arises because the preposition in can either modify drove or street; this example is an instance of what is called prepositional phrase attachment ambiguity. Humans do a remarkable job of dealing with ambiguity, almost to the point where the problem is unnoticeable; the challenge is for computers to do the same. Multiple ambiguities such as these in longer sentences conspire to give a combinatorial explosion in the number of possible structures for a sentence. Usually the vast majority of these structures are wildly implausible, but are nevertheless possible and must be somehow discarded by a parser. SyntaxNet applies neural networks to the ambiguity problem. An input sentence is processed from left to right, with dependencies between words being incrementally added as each word in the sentence is considered. At each point in processing many decisions may be possible—due to ambiguity—and a neural network gives scores for competing decisions based on their plausibility. 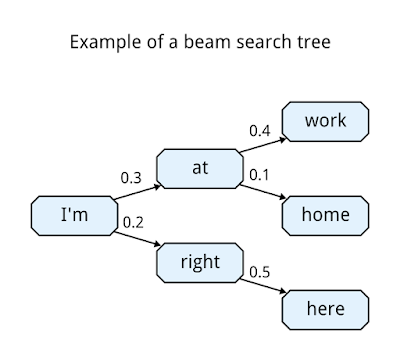 For this reason, it is very important to use beam search in the model. Instead of simply taking the first-best decision at each point, multiple partial hypotheses are kept at each step, with hypotheses only being discarded when there are several other higher-ranked hypotheses under consideration. An example of a left-to-right sequence of decisions that produces a simple parse is shown below for the sentence I booked a ticket to Google. Furthermore, as described in our paper, it is critical to tightly integrate learning and search in order to achieve the highest prediction accuracy. Parsey McParseface and other SyntaxNet models are some of the most complex networks that we have trained with the TensorFlow framework at Google. Given some data from the Google supported Universal Dependencies project, you can train a parsing model on your own machine. So How Accurate is Parsey McParseface? On a standard benchmark consisting of randomly drawn English newswire sentences (the 20 year old Penn Treebank), Parsey McParseface recovers individual dependencies between words with over 94% accuracy, beating our own previous state-of-the-art results, which were already better than any previous approach. While there are no explicit studies in the literature about human performance, we know from our in-house annotation projects that linguists trained for this task agree in 96-97% of the cases. This suggests that we are approaching human performance—but only on well-formed text. Sentences drawn from the web are a lot harder to analyze, as we learned from the Google WebTreebank (released in 2011). Parsey McParseface achieves just over 90% of parse accuracy on this dataset. While the accuracy is not perfect, it’s certainly high enough to be useful in many applications. The major source of errors at this point are examples such as the prepositional phrase attachment ambiguity described above, which require real world knowledge (e.g. that a street is not likely to be located in a car) and deep contextual reasoning. Machine learning (and in particular, neural networks) have made significant progress in resolving these ambiguities. But our work is still cut out for us: we would like to develop methods that can learn world knowledge and enable equal understanding of natural language across all languages and contexts. To get started, see the SyntaxNet code and download the Parsey McParseface parser model. Happy parsing from the main developers, Chris Alberti, David Weiss, Daniel Andor, Michael Collins & Slav Petrov. This week, San Juan, Puerto Rico hosts the 4th International Conference on Learning Representations (ICLR 2016), a conference focused on how one can learn meaningful and useful representations of data for Machine Learning. ICLR includes conference and workshop tracks, with invited talks along with oral and poster presentations of some of the latest research on deep learning, metric learning, kernel learning, compositional models, non-linear structured prediction, and issues regarding non-convex optimization. At the forefront of innovation in cutting-edge technology in Neural Networks and Deep Learning, Google focuses on both theory and application, developing learning approaches to understand and generalize. As Platinum Sponsor of ICLR 2016, Google will have a strong presence with over 40 researchers attending (many from the Google Brain team and Google DeepMind), contributing to and learning from the broader academic research community by presenting papers and posters, in addition to participating on organizing committees and in workshops. If you are attending ICLR 2016, we hope you’ll stop by our booth and chat with our researchers about the projects and opportunities at Google that go into solving interesting problems for billions of people. You can also learn more about our research being presented at ICLR 2016 in the list below (Googlers highlighted in blue).